Artist Timothy Lantz has skillfully woven together intriguing elements from mythology and mysticism to create a hauntingly beautiful tarot deck. 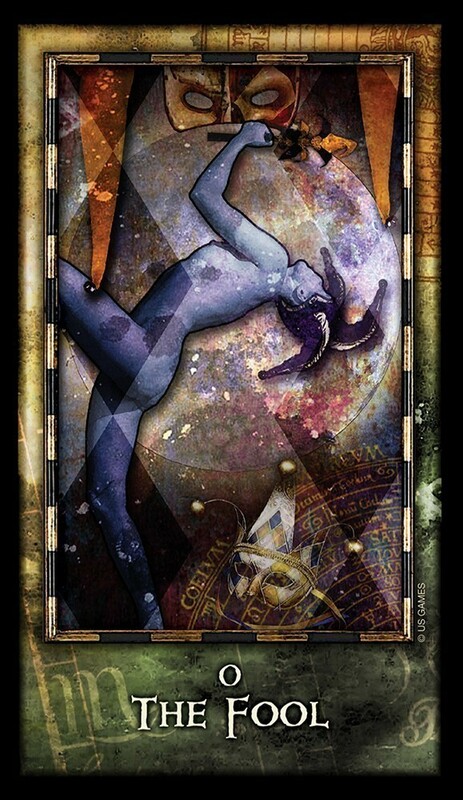 Those who explore the Archeon Tarot will find layers of meaning in the cards's mystical symbolism and dream imagery. This deck offers unique perspectives and a contemporary appeal. Includes custom spread sheet. 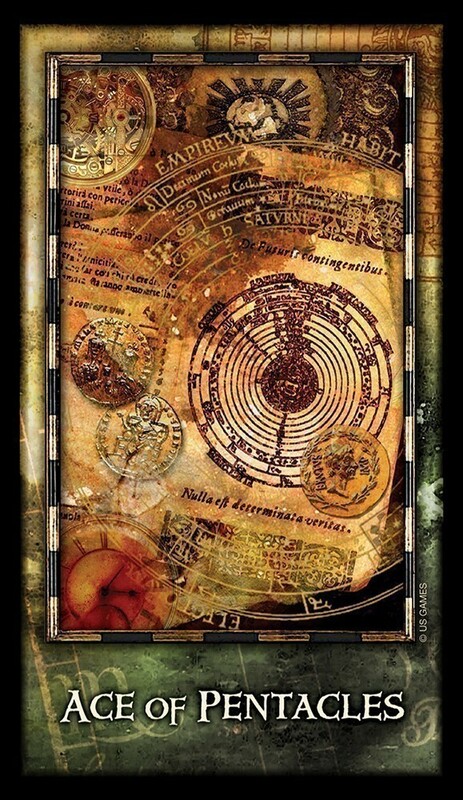 The Archeon Tarot is a stunningly beautiful, dark deck created by Timothy Lantz, an incredibly talented and creative visionary, who has brought his unique vision to many mediums and media. 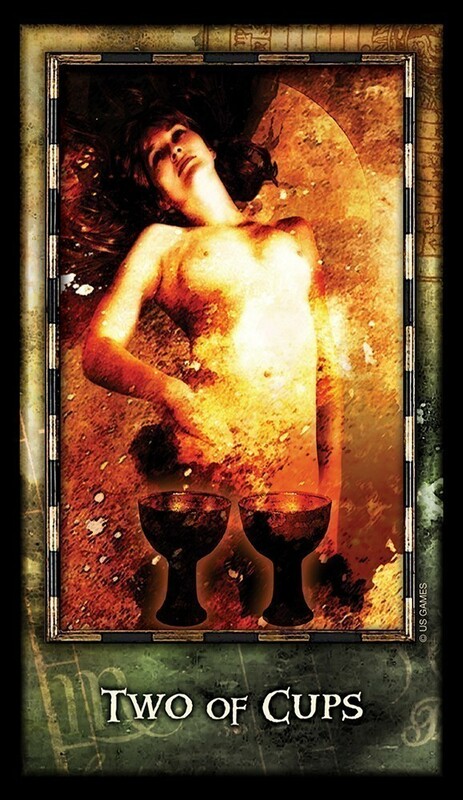 The Archeon Tarot is the manifestation of this vision as applied to the Tarot. This deck was initially produced a few years ago and has recently been re-issued as a "Premier" edition, which features the deck, the little white book (LWB), and a special layout sheet depicting the Celtic Cross, inviting users to apply stunningly re-imagined cards within a traditional spread context. A masterful blending of old and new. The artwork in this deck is breathtaking. The visuals are abstracted collages of color and symbology and remind me of dreams - imagery is suggested through color and shadow as well as lines. It seems both fresh and ancient at the same time. The people are eerily human, with many cards focusing the detail on the face of the figure in the card. Timothy Lantz himself makes a cameo appearance in the deck as the King of Cups, gazing directly at the reader and inviting him or her into the dream-state imagery. 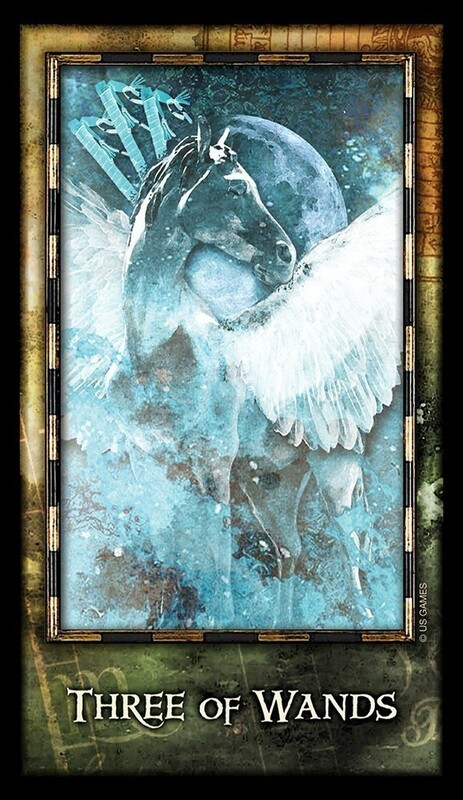 My favorite card in the deck is Temperance. The imagery of an angel (or woman) with a lamb on one side and a tiger on the other really brings the message of what I thought the card was supposed to mean (but didn't really see it before). Although the imagery can be dark and very abstract or interpretive, the cards are very readable. The deck includes a LWB in which Mr. Lantz has provided both traditional upright and reversed meanings for each card, as well as a quote or phrase that enhances, or provides context for, the card meaning. In many respects, the phrases serve to provide insight not only into the pip card itself, but into numerology also. At the front of the LWB, he briefly discusses symbolism and its role in the deck. The booklet also contains instructions for using the Celtic Cross layout. The kit also comes with a large sheet that has the Celtic Cross layout diagrammed on it, for use with the cards. As I mentioned before, I like the mix of the new, edgy imagery in the cards used with a very traditional spread like the Celtic Cross. The subtitles and the symbology of the images invite deeper study, making the Archeon Tarot an excellent deck for those who enjoy a challenge. I think this is a stunning deck that would be a valuable tool to add to any reader's deck collection, not only as a "book" of Timothy Lantz's artwork, but also as a very useful tool for reading for oneself or reading for others. 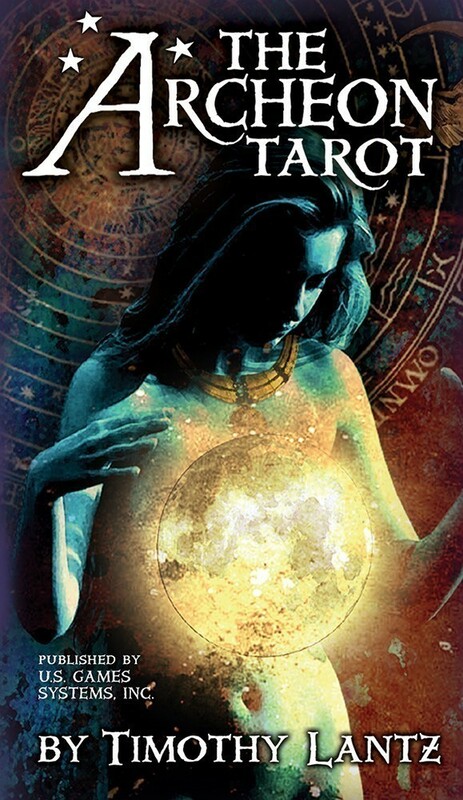 The Archeon Tarot became my main personal reading deck the moment I had it in my hands. I was intrigued by the images I'd seen online, but certainly did not expect to connect with it on such a personal level. 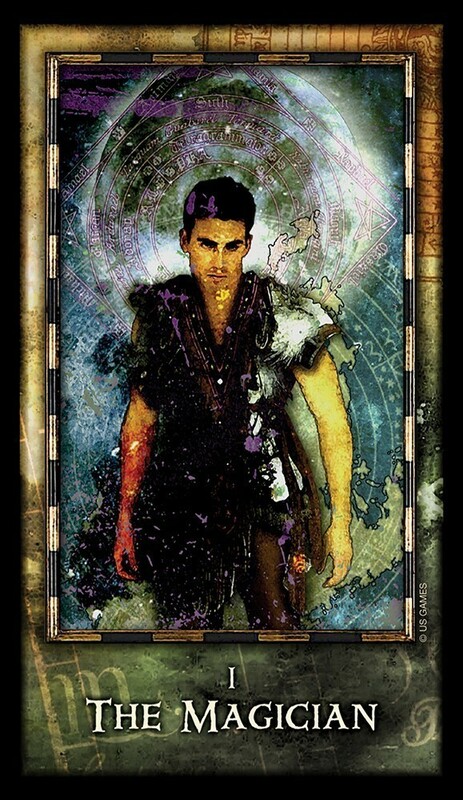 The Archeon Tarot is a digital collage deck, which normally I steer clear of. But the seamless and dreamlike way this one was done appealed to me. It does not scream "collage" in the traditional sense of disconnected images slapped together. The images in this deck are dark. And by that I mean literally dark in hue. I don't find it to be so much a dark/gothic deck as a deck with incredible depth and layers. 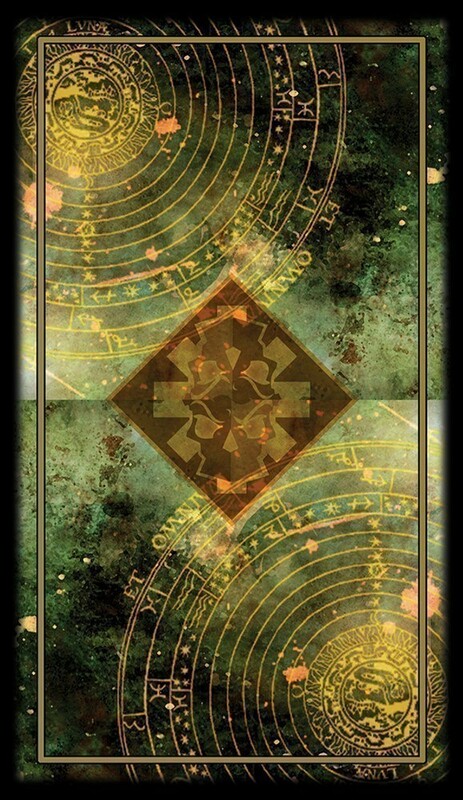 What I love about it is that the cards serve as a perfect gateway to your intuition, if you are open to allowing yourself to experience intuitive reading. There are no canned readings with the Archeon. When I pull this deck out, my intuitive muscles are stretched and I read from my soul rather than from my mind. One of my favorite cards would have to be the Five of Swords. How hot is he?! I would gladly accept defeat at his hands as long as I could watch him do it. The Tower is another of my favorite cards in this deck, and probably my favorite Tower card of any deck. It just exudes the overwhelming feeling you're supposed to get with this card. There is a woman crouched down in the forefront of the card, protecting her head with her hands from the inferno ruining the building behind her. The Four of Wands gives me this powerful "starting fresh" feeling. The Queen of Swords is hauntingly beautiful. The Six of Pentacles is effective in its simplicity. I really like the atmosphere of the Seven of Wands, in which an old house is made into a character. I clicked with the Archeon immediately on a soul level and the readings I do with it are hard to put into words. It's more of a comprehensive knowing I get, and all the images gel together to create a deep understanding of what I'm supposed to know. I have found that these cards do not beat around the bush. They deliver the truth and nothing but the truth, no matter how ready you are to face it. One of the first drawings I did with the deck was inquiring if I could trust a certain man I had just met. I was having iffy feelings about his integrity. I pulled a single card, the Seven of Swords, which shows a raven holding in its mouth a shiny gold piece hanging from a chain. I knew instantly this man couldn't be trusted, and it turned out I was absolutely right. The deck is not light and fluffy, sparing your feelings. It gets down to the nitty gritty, to the stuff you may have been shoving down in the back corners of your consciousness. So it's not for the faint of heart or mind, but rather for those brave souls who want to gain access to their inner (and outer) worlds, no matter how long the dust has been settled there, or how raw it will make your emotions. The Archeon Tarot surpasses the superficial and gets down to what's real. And for this, I find it an invaluable collection of 78 pieces of card stock! I love this art. Love, love, love it, and yes, that's all I cared about in wanting it and I would have bought it, caring only for that--but a friend gave it to me, very kindly. For me? They're many things; artwork I just admire, for one. Useful when I need a random prompt for writing, be it by the image itself, the meanings, or the meanings I assign myself to the images I like best--which I do for every deck, and they're not the same for each card. And a sort of meditation/reminder/thought-provoker tool. By this I mean, I take the cards, be it the entire set using the meanings assigned or my selection of cards I like with meanings I assigned, and randomly pick one. Say it's The Star, and I've decided that it stands for Honor. Then I think, meditate, reflect, on the concept, and the way it could relate to my life--is my honor intact? Do I need to do something to repair it? Have I done damage to another's honor (or reputation), and what can I do to repair it if so?